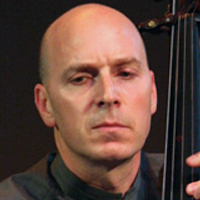 Leigh Mesh, associate principal double bass, joined the Metropolitan Opera Orchestra in 1993. A graduate of the Curtis Institute of Music, he began his professional career with the Columbus Symphony Orchestra and later played with the Indianapolis and Chicago symphony orchestras. He has taught master classes at the New World Symphony in Miami, Cincinnati Conservatory, Juilliard School, and Manhattan School of Music. Mr. Mesh is the double bass coach of the UBS Verbier Festival Youth Orchestra. He has been a guest artist with the Verbier Festival, Santa Fe Chamber Music Festival, Strings Music Festival, Linton Chamber Music Series, Pensacola Classicfest, and Salt Bay Chamberfest, performing with artists such as Thomas Quasthoff, Salvatore Accardo, Lynn Harrell, Lisa Batiashvili, Yuja Wang, Gautier Capuçon, and Daniel Hope. Mr. Mesh has performed with the MET Chamber Ensemble, Caramoor Virtuosi, and the Brentano, Ebene, and Tokyo string quartets. Mr. Mesh was a faculty member of the Colburn School of Music in Los Angeles during the 2009/10 school year. He joined the faculty of Bard College in the fall of 2010. He lives with his wife Nancy Wu, associate concertmaster of the MET Opera Orchestra, and their two children, Guinevere and Wolfram, in Pleasantville, New York. He pursues cycling and skiing whenever he can.